Yes that is Jeff Coutelou in his briefs. Why? It’s a simple explanation honestly. The tank of Mourvèdre was ready for remontage. That is where juice from the bottom of the tank is pumped over the cap of grape skins, pips etc (the must) which rise during fermentation. That cap becomes hard and there is a risk of bacterial infection plus the whole idea of having the skins in there is to extract tannins, colour and flavour so it’s pointless having them separated from the juice. You may recall that this was the tank where Jeff had to improvise last Monday when the érafloir broke down. Some of the bunches were destemmed, others went in whole bunch. There is therefore a higher than usual amount of solid material in the tank. This had formed a solid cap and Jeff needed it to be pushed back into the juice. A fork was used at first as is normal (the process called pigeage), but the crust was too firm. So, Jeff took off his boots and socks and climbed in. This is dangerous for two reasons. He could fall through the cap and into the juice and, secondly, there is a lot of carbon dioxide coming from the fermentation which, as I found out, can make you ill. So hanging on to the sides and with myself and Matthieu ready to catch hold Jeff pushed down with his feet onto the cap. He described the cap as cold but underneath the fermentation meant that the juice was hot. As Jeff pushed down the cap it was fascinating to see the gentle bubbling of the fermentation process, sadly it was too dark for the camera to pick up. As he pushed the cap down, Jeff needed to push lower so, off came the trousers. Moving around the tank the cap began to sink bit by bit. Out he came and a normal remontage took place though in his briefs! And the wine? Well it tastes very good, perhaps with more legs in the glass than usual. Categories: Vignerons, Wines | Tags: Jeff Coutelou, Mas Coutelou, Mourvedre, pigeage, remontage | Permalink. The last case of 2017, Julien looks happy! In other words, the finish. Well, the finish of the picking. Tuesday September 12th was so much calmer than the previous day as the Cabernet Sauvignon from Segrairals arrived. Thoughout the vendanges the grapes have been good, smaller than the norm because of the dryness, but in excellent health. The Cabernet was no exception. Sorting was all about snails and dry leaves rather than any problems with the grapes and the vat filled gradually, problem – free, as the day progressed. The stalks were brown showing the maturity of the bunches as the third érafloir of yesterday completed its job efficiently. As we awaited the first cases Jeff and I went around some of the vats and took samples for analysis as well as tasting the wines. I wish that I could convey the bready aromas filling the cellar of the yeasts at work, they give such a sense of change, optimism, alchemy. Amongst the wines we tasted were two from 2016, Syrah and Grenache, which have been sparked back into fermentation by the very presence of this year’s grapes in the cellar. The process is truly amazing. The glass in the photo below shows the top Syrah from La Garrigue harvested two weeks ago, which just may become La Vigne Haute. It is a stunner. Quality across the board is undoubtedly high though Jeff is counting the cost of the quantity, his first estimates are that the overall yield will be around 39 hectolitres per hectare. Average years would give between 50 and 60 hl/ha. Joining us on the day was a former student of Jeff and Vincent restaurateur Régis Lamazère and his wife and baby. Régis runs his autonymous restaurant in Berlin where Charles who was here for vendanges 2016 used to work. After the grapes were in and the last cases sorted by Julien and Vincent it was time to start serious cleaning of all the equipment which will be put away for 2018. The picking may be over but the work never stops. A full programme of pressing, remontages etc is in place for the next week. Stay tuned. Categories: Vignerons, Vines, Wines | Tags: érafloir, Cabernet Sauvignon, Grenache, La Vigne Haute, remontage, rendement, Segrairals, Syrah, yields | Permalink. A week into picking and the team is in a routine, working smoothly to steadily bring in the grapes. The quality remains high but there can now be no doubt that the ongoing dry spell has taken its toll. Quantities are down by up to 50%, bottles of the 2017 Mas Coutelou wines will be more difficult to seek out I’m afraid and, inevitably, more expensive. Thursday saw the Flower Power vineyard picked (Rec D’Oulette to give it the proper name) and just 7 cases of grapes were returned from the 0,4ha of vines. They are young still and will have found it hard to cope with the arid conditions. Rome, too, was picked and I went along as this is my favourite vineyard. 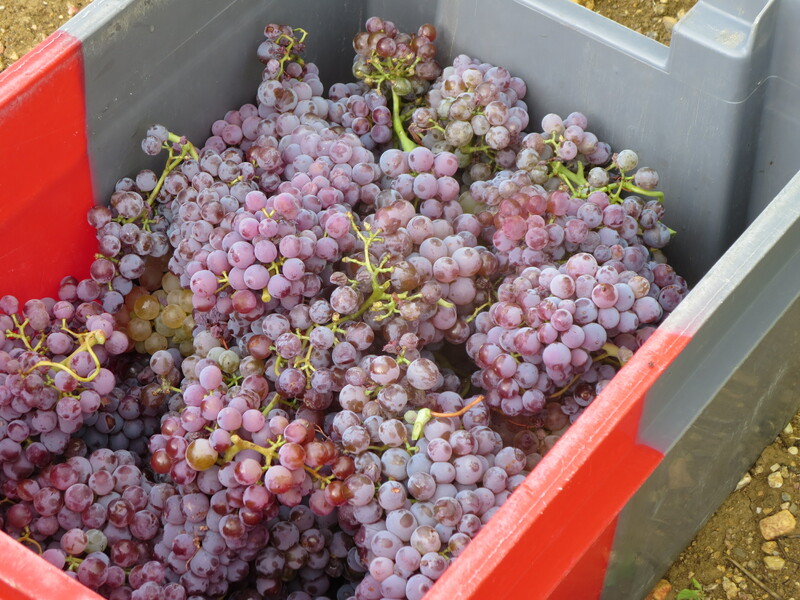 Cinsault, Muscat and all three types of Grenache were harvested. From Peilhan came Grenache Gris and a few rows of the Maccabeu which will go into the PM rosé wine. By now we are into the second stage of the vendanges. The grapes picked previously have been sitting on skins for varying lengths of time to extract colour and flavour but they will be separated when Jeff decides that further contact will not enhance the wine further. The juice is pumped to a new tank leaving the skins and pips behind to be used as marc for distilling. This process of remontage is carried out increasingly as more tanks fill up. Tracking which wines are where is a skill in itself, each time the wine will be tasted and sent for analysis to ensure that acidity, sugars, potential alcohol are all correct and no nasty surprises await. Jeff took me round a few of the vineyards to check on their progress for picking. We started with the Carignan, then on to the Mourvèdre and Cinsault of Segrairals. In all cases the pips and stalks showed us that more time was needed, they are still a little too green. Tasting the grapes showed plenty of sweet fruit but that greenness would not be good in the finished wine. Friday was based in the biggest parcel, Segrairals. Cinsault grapes first, to be pressed immediately so that a light pink juice emerges ready to be blended with the other rosé grapes. This happened on Saturday so that all the rosé grapes will ferment together to blend fully. Jeff explained to me that Cinsault is harder to press than most, the large berries contain a lot of pulp which breaks down less easily. Afterwards the remaining Syrah was tackled, again I went along to help with a bit of picking as well as doing the sorting with Jeff back in the cellar. 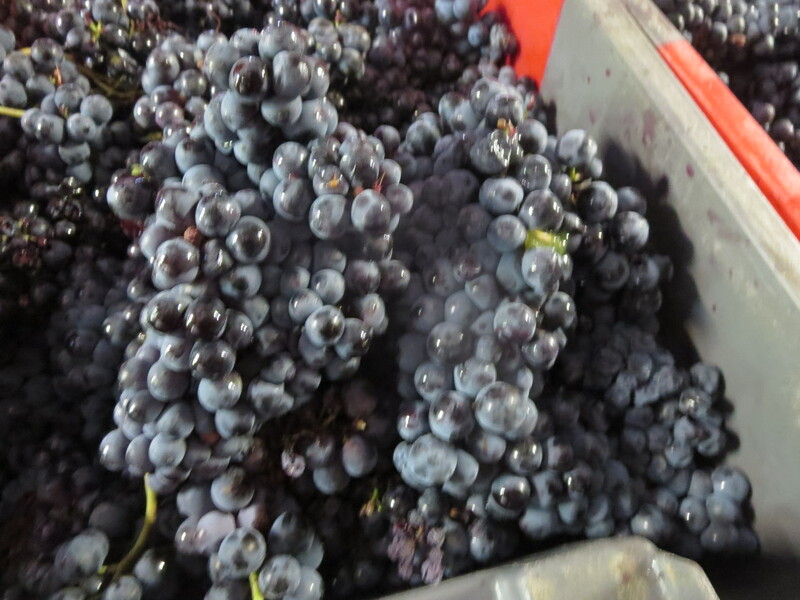 The tri was not too difficult as good, firm bunches of healthy grapes came in case after case. Never mind the width feel the quality seems to be the motto, for Jeff’s sake greater quantity would be welcome. More remontage, more testing in the cellar. It was good to see the white wines in good condition with fermentation already lively; bready, yeasty smells began to fill the cellar. More Syrah would be picked on Saturday morning but, readers, I admit that I took a break. The hard work, rich variety of grapes and early mornings meant that this time AMarch was not in the vines. Categories: Vignerons, Vines, Wines | Tags: Carignan, Cinsault, Flower Power, Grenache, Grenache Gris, Maccabeu, Mas Coutelou, Mourvedre, Muscat, Peilhan, PM Rosé, remontage, Rome, Segrairals, Syrah, vendange | Permalink. The grapes are picked, how do we make this become wine? That has become the main objective now at Mas Coutelou. The grape skins, pips, flesh and solids are with the juice in the tank (cuve) for as long as Jeff feels that they will benefit the juice. They give the juice chemicals such as anthocyanins which give colour to the juice (for rosé and red wines), tannins and flavour compounds. The solid parts of the mix tend to rise to the top of the tank and float on the juice. This cap must be kept moist, a dry must would give unpleasant flavours and is more prone to harmful bacteria. That is why remontage and pigeage have to be carried out, as explained before. Jeff will taste from each cuve every day and samples are sent to oenologue Thierry Toulouse for analysis. When he is happy that the right balance of sugars, acidity, colour and flavours is achieved it is time to press the wine. Some of the must is left behind in cuve and will be collected to use again, for example in distilling. The pressed juice goes into a new cuve and will continue its fermentation into wine. The yeasts on the grape skins and in the atmosphere of the cellar change the grape sugars into alcohol. The fermentation will have begun when the must was in contact but will continue when just the juice remains. I wish I could convey the smell of the fermenting juice via the page you are reading. It is like walking into a boulangerie in the early morning, bready aromas fill the air as the yeasts go about their work. One of the real highlights of the whole process. Whilst that is all going on the equipment which has been used so much in the last month is checked over, taken apart and given a thorough cleaning. 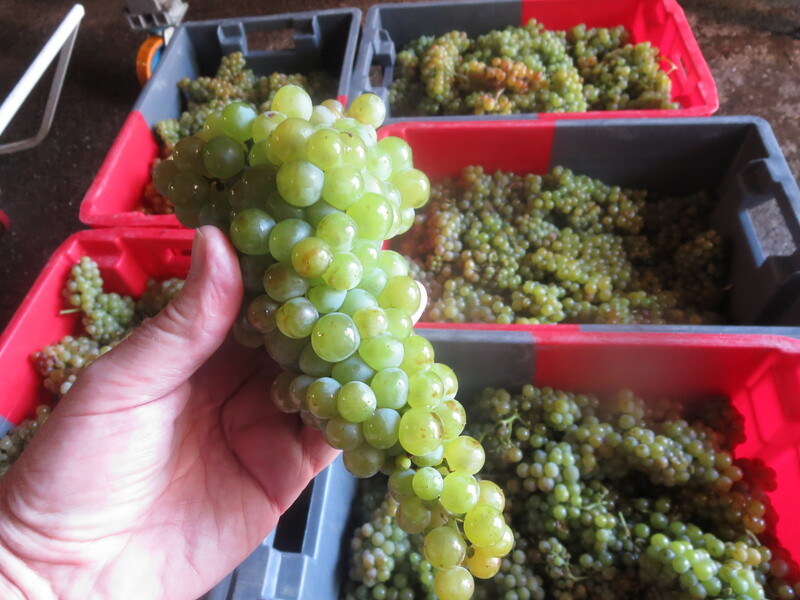 Not a pip, not a grape skin must be left in the sorting table, presses, égrappoir (destemmer) or anything else. No chance of bacteria gathering. It is not straightforward. The process of grape juice to wine is a natural one and things can go wrong. Any vigneron who had a year where the process went without any hiccoughs would be either the luckiest alive or a liar. Yeasts can suddenly stop working, fermentations become too hot, bacteria (both helpful and harmful) are unpredictable. Jeff must be aware of every cuve and of their analyses, he must use his experience to tackle any issue which springs up at any time of day or night. He rejects the use of sulphur dioxide (SO2) to act as an antiseptic or stabiliser for the wine, therefore that experience is tested time and again. No wonder he wears an air of fatigue. Categories: Vignerons, Wines | Tags: anthocyanins, fermentation, Mas Coutelou, oenologue, pigeage, remontage, tannins | Permalink. The weather has had its say and threatens to shout out loud in the next few days. Should we expect anything different in this most problematic of years? Saturday (Sept. 10th) was supposed to be a day for picking but a heavy shower fell in the morning and that was enough to stop the day in the vineyards. Grapes covered in rainwater would provide diluted juice, no good for quality producers though that did not stop some in the area. However, there was still work to do in the cellar, remontages and pressing. The previous day some of the team had been clearing space in the solera cave so that the Muscat and Grenache picked from Rome vineyard would have room. Sunday was a day off though more remontage and cellar work was done. There is no rest. Today (Monday 12th) was a normal day for many vignerons but at Mas Coutelou a big part of the team are the Moroccan pickers and it is Eid Mubarak. Therefore Jeff decided that they deserved the opportunity to celebrate their holy day and so no major picking. An act of respect which deserves mention. Sadly, that act seems unlikely to be rewarded by the weather. There is a major threat of a large storm on Wednesday which would halt work again and require a few days for the grapes to recover before they could be harvested. More careful triage will also be required. Let us hope that the storm weakens or diverts. Meanwhile Carole, James, Vincent and Charles were out picking Carignan Blanc this morning in Peilhan and the Grenache from Sainte Suzanne was pressed. Work continues despite everything this year throws at us. 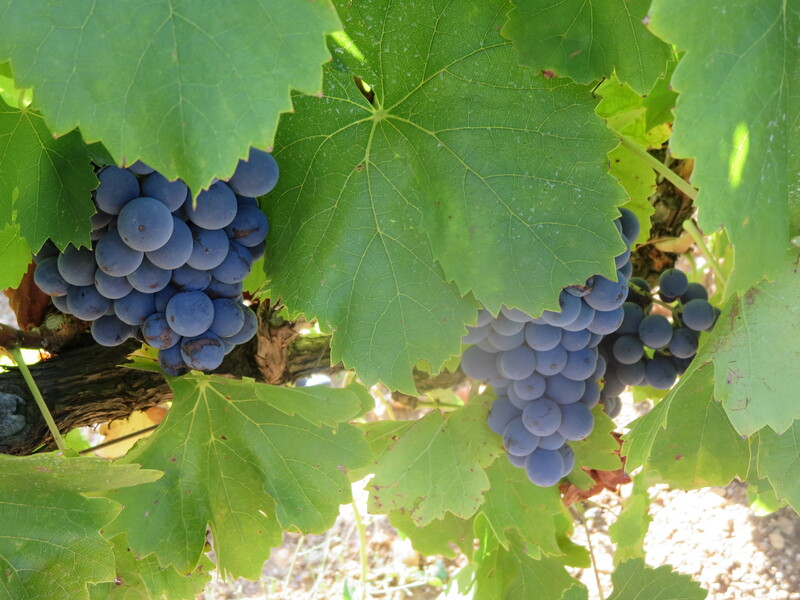 Tomorrow will see the harvest of Syrah from La Garrigue, the grapes which usually make La Vigne Haute. Categories: Vignerons, Vines | Tags: La Garrigue, La Vigne Haute, Mas Coutelou, rain, remontage, solera, Vendanges | Permalink. When I mention vendanges to most people they think of grape picking and, maybe, putting the grapes into a tank (cuve). However, vendanges means much more than that and we are now entering stage two of the process. When the grapes have been picked and sorted they are stored in a cuve where the juice interacts with the skins extracting flavour, colour and also coming into contact with the yeasts which grow naturally on the skins. These yeasts then begin the process of fermentation which turns the sugars in the juice into an alcoholic wine. This mix of juice, skins, pips and flesh is known as must. So, whilst picking continues at Mas Coutelou Jeff must already plan what is happening to those cuves of grapes which were picked a few days ago, You will remember from #1 that we picked Grenache and Syrah on days 1 and 2 and that they were in cuves 2A and 2B. They are picking up colour and the fermentation means that the sweet grape juice of last Wednesday is already very different. Still plenty of raspberry and red fruit flavours but the sugar levels have fallen and the liquid is now more austere, a little acidic and with a weight of alcohol. It has turned from child into young adult. To ensure that the grape skins do not give unpleasant flavours, volatility etc., Jeff must ensure they do not dry out as they float on the juice, forming what is known as the cap (chapeau). Therefore, wine is pumped from the bottom of the cuve over the top of the chapeau to push it down a little and to moisten it. This is known as remontage. Alternatively, an instrument or hand can be used to push the chapeau down into the juice, a process called pigeage. When Jeff is satisfied that the juice is ready and has had optimal skin contact he will begin pressing the must to leave the final juice. We await the first press as yet but it will be in the next couple of days as the Grenache and Syrah are already showing their adolescence. Meanwhile picking continues. 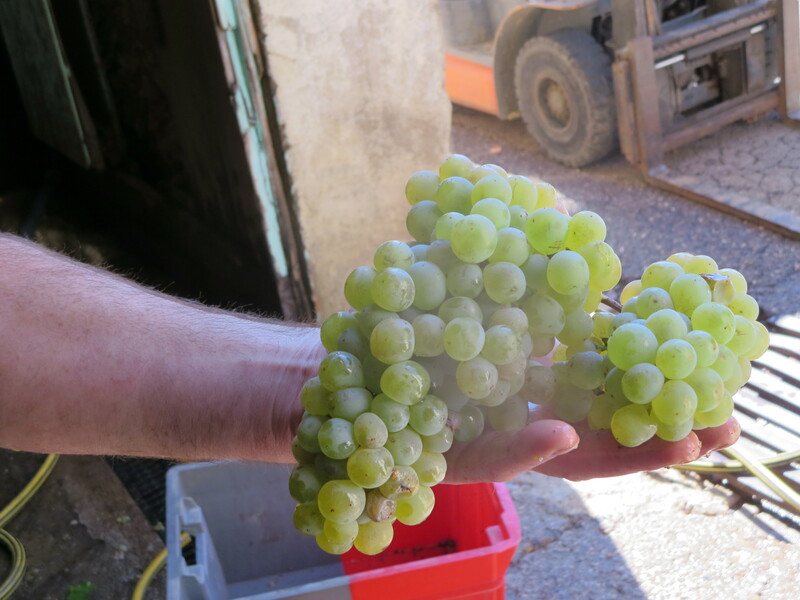 Friday saw Sauvignon Blanc and Muscat À Petits Grains as the first white grapes of 2016 at the domaine. 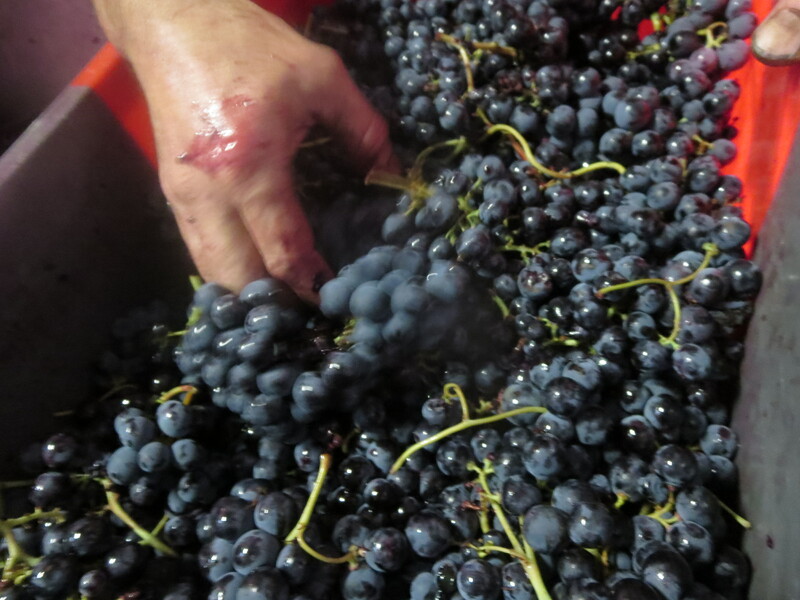 Monday saw the picking of the Merlot from Colombié which will, unusually, find its place in the Coutelou cuvées. I am no great fan of Merlot but the grapes were lovely and the juice tastes especially rich and full. Today (Tuesday) was Flower Power day, sadly the snails won the battle this year. They ate so many of the buds in Spring that the vines struggled to produce much. The dryness merely confirmed Font D’Oulette would be low yielding in 2016. Around twenty cases is not much return for such a lovely parcel of vines. High quality grapes from the various cépages but very low quantity. Clairette and Oeillade from Peilhan with some Grenache Gris and Muscat Noir was added to the mix. 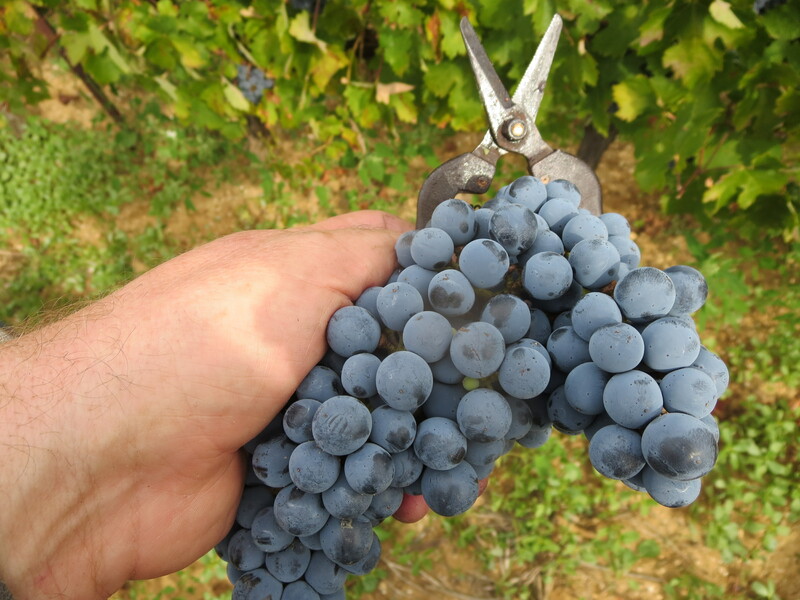 Also picked was the Cinsault from Rome which was in good condition with nice big berries. So my two favourite vineyards are already harvested. 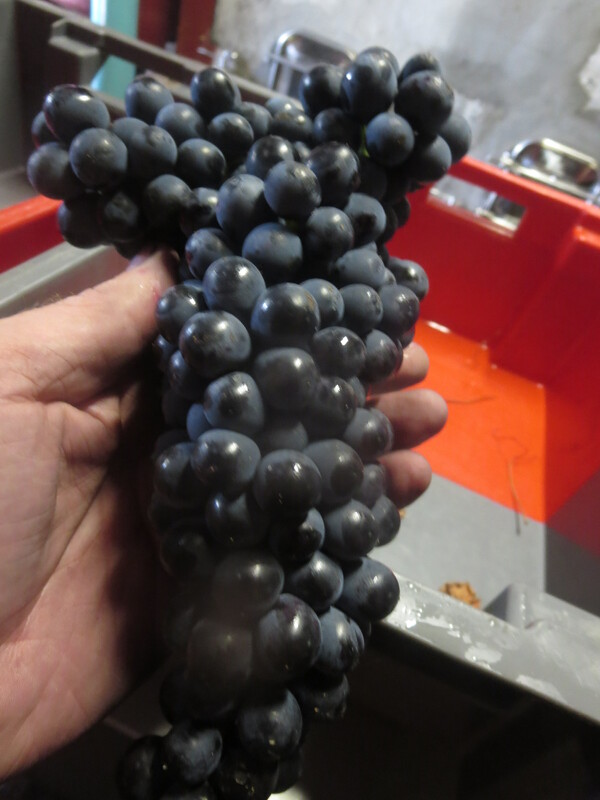 Finally, some lovely Syrah from Segrairals was picked and there will be much more of this tomorrow. This Syrah is such good quality that Jeff is already excited about what he can do with it. Segrairals is the biggest vineyard of the domaine and is also serving up some of its best fruit. A new sorting table was brought into play this week and it is certainly much more efficient than the previous method of sorting from the cases themselves. Triage of better quality but also much speedier too. The table is already paying for itself. So, stage 1 (picking) is well under way, stage 2 (the must in cuve) is under way for some and stage 3 (pressing) will shortly begin. The jigsaw is already becoming more complicated for Jeff Coutelou. Categories: Vignerons, Vines, Wines | Tags: Clairette, Flower Power, Grenache, Grenache Gris, Muscat Noir, Oeillade, pigeage, remontage, Rome, Sauvignon Blanc, Segrairals, Syrah, Vendanges | Permalink.